First, do a little practice. 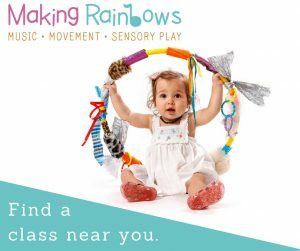 This activity IS very simple, however there is a process to follow for best results. 1. Rule a piece of paper in 4 equal squares. 2. 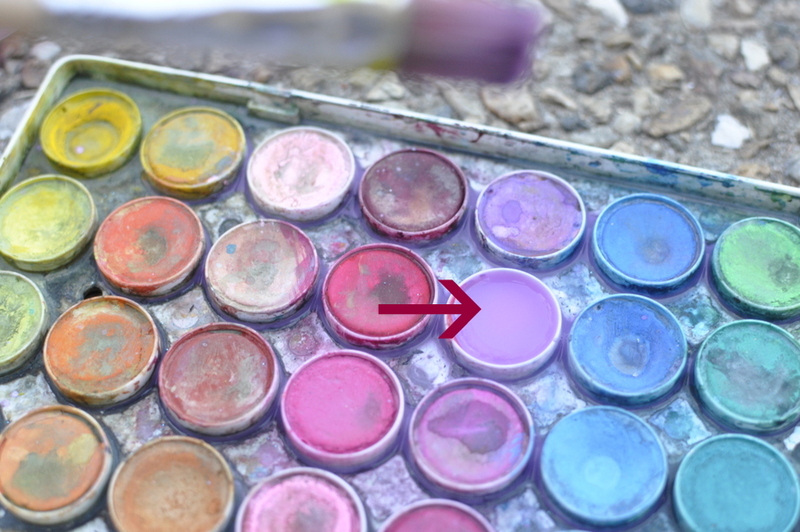 If using powder watercolours, fill the desired colour with water and mix the powder through so it’s very wet. 3. Dip the large brush into the paint and then hold over the first square. Hit the brush with paint on the handle of another brush to spray the paint on the page. When the brush is very wet, the dots are larger. After a few hits, move to the next box for smaller dots, then to the next and to the last. 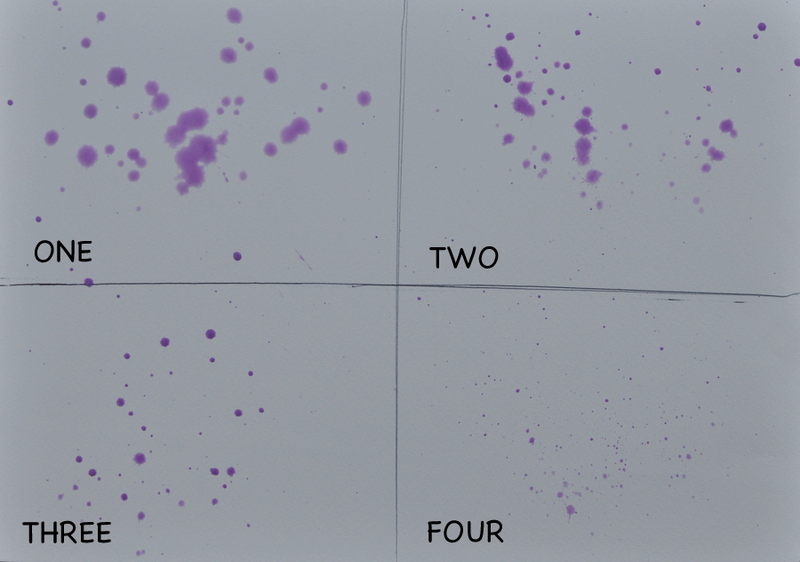 For the last one, you will have to hit hard to disperse the dots (because the brush will be quite dry at this point)…and they are very small. This pre-activity gives an idea of how wet you want the brush to be/what it will look like/how far to hold the brush for the paper/how hard to hit. 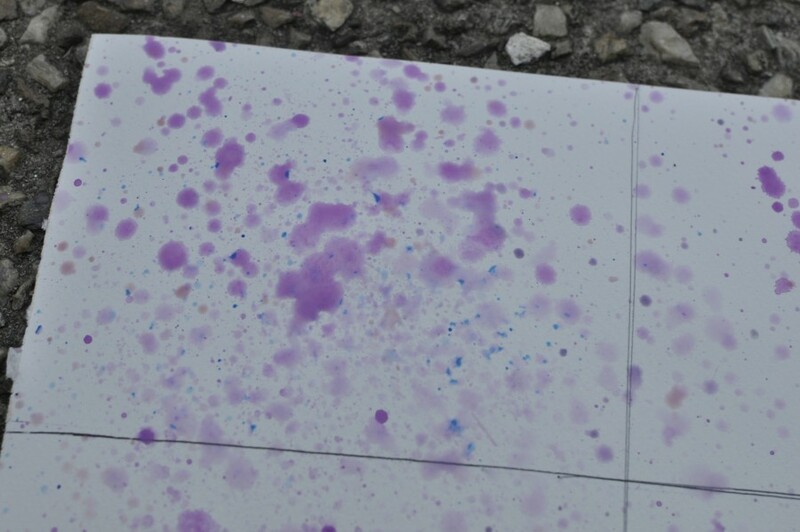 Once the four squares are filled with different splatters, experiment with building the splatter to see how it looks. Once the testing is done, it’s time to get started. 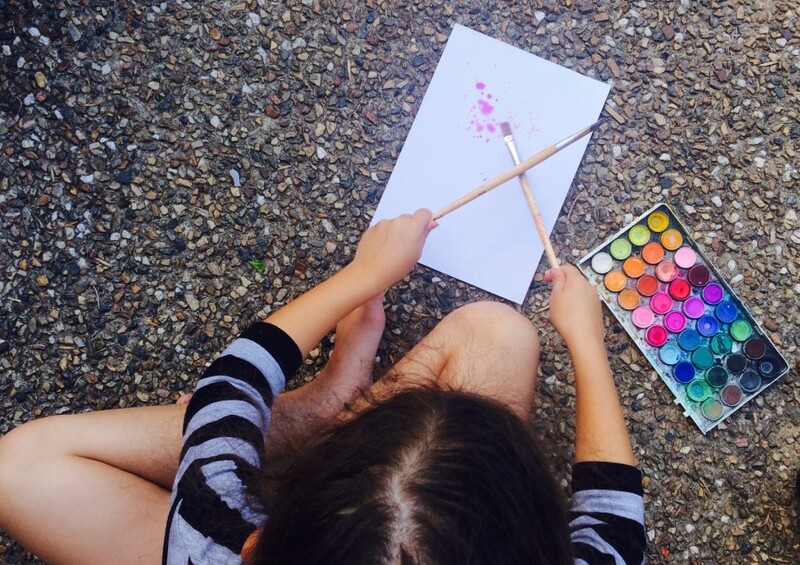 Start with the hitting/spraying of the paint on the paper in the same way as the practice, adjusting how wet the brush is for different splatter patterns. Just keep in mind the shape you want the tree to be. 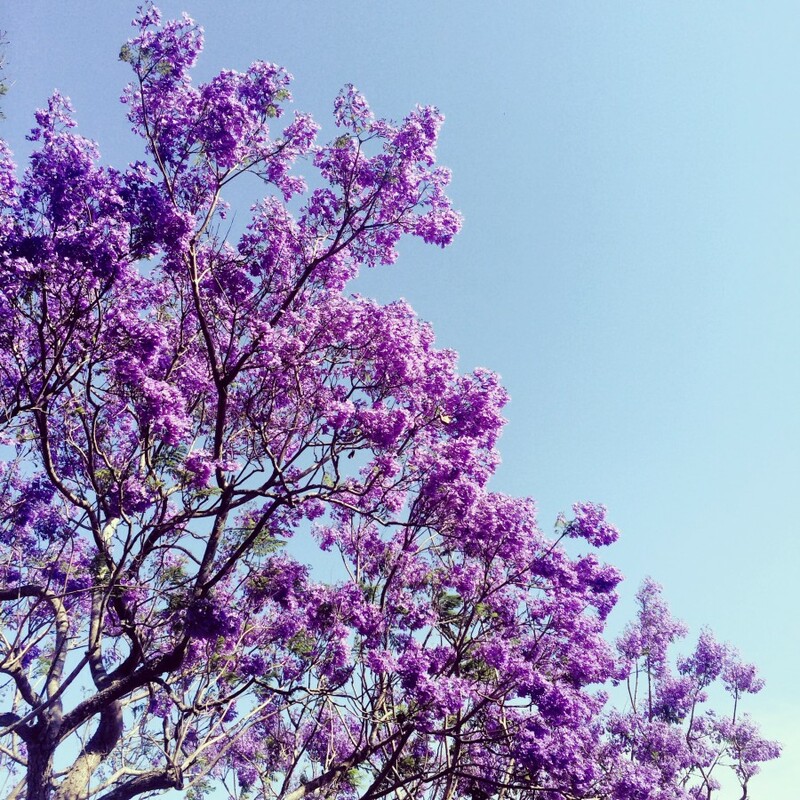 Jacaranda trees tend to be more spread out in a oval shape so keep an invisible shape in your head, allowing room for the tree trunk at the base. 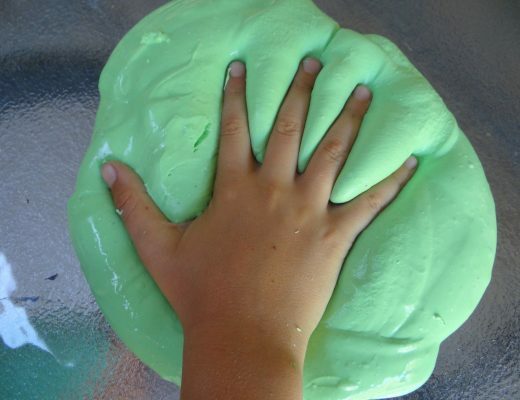 The idea is to do this in layers (as pictured below). The first 3 pictures (L to R) are different layers of dots made with the method practiced in Step 1 over and over again. The 4th picture is a small hit of pink. The 5th a (tiny) touch of blue (just for a little depth) – optional. Allow this first stage to dry. 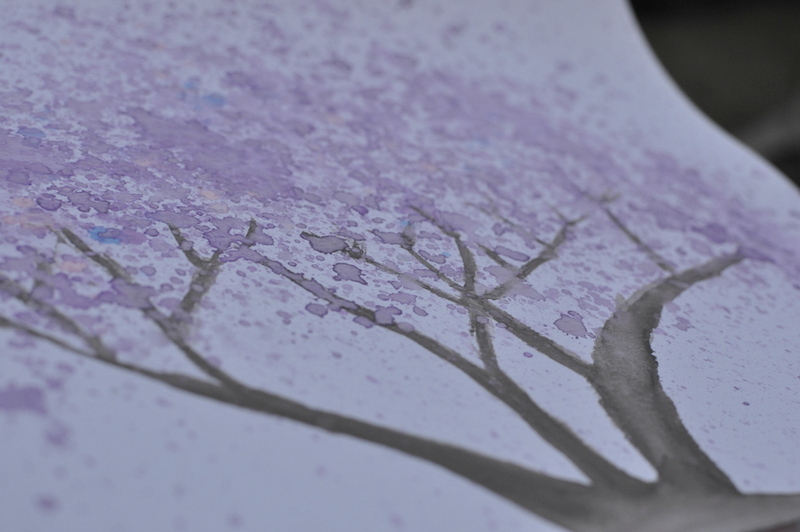 The blossoms won’t be done yet, you will add more once it’s dry. 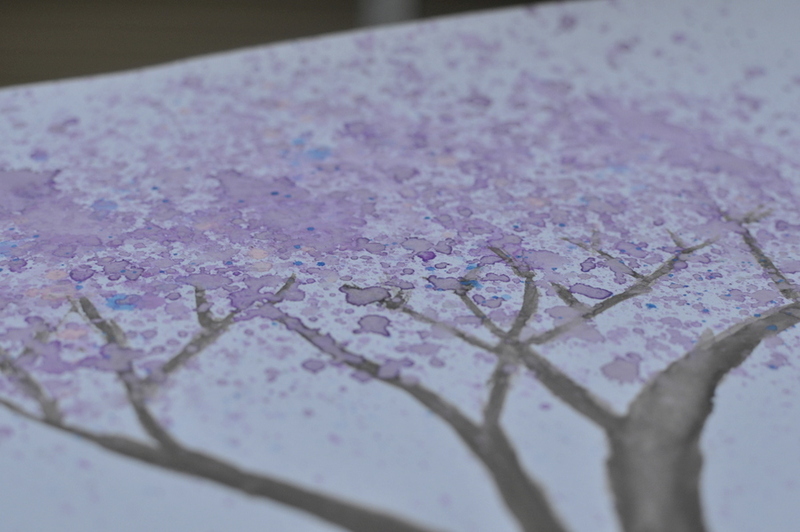 When the trunk is dry, make more blossoms with the paint spray over the top until you have the look you want! Note: As the paint dries, it becomes less intense. If you do a quick google of ‘Jacaranda tree trunks’, it will give you a sense of the shapes. Jacaranda trees often have a few low branches/trunks that spread out widely. I went with very simple/achievable with my kids and we did three trunks that end where the bloom starts. 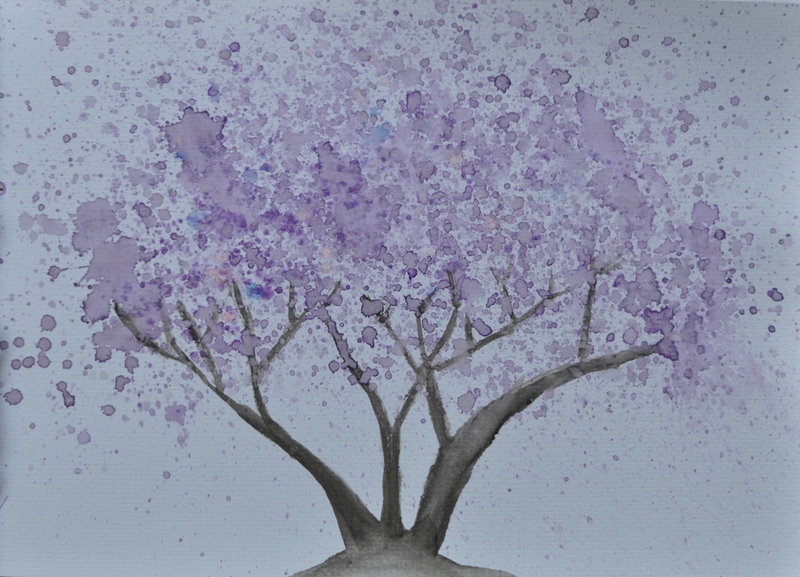 The Jacaranda tree pictured below has a special story to it, and you can read about it here. 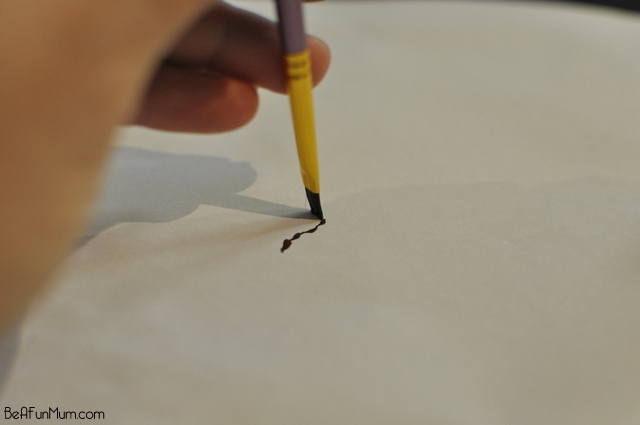 Use the a small round or square brush to draw in the branches. Again, it’ s good idea to do a test run on a scrap piece of paper before drawing it on the final copy. One thing to try for branches that are thin: use the top of the a square top brush to press down (rather than stroke) – as demonstrated here. Once the trunk and bloom is dry, add more blossoms if desired by using the process at step 1. 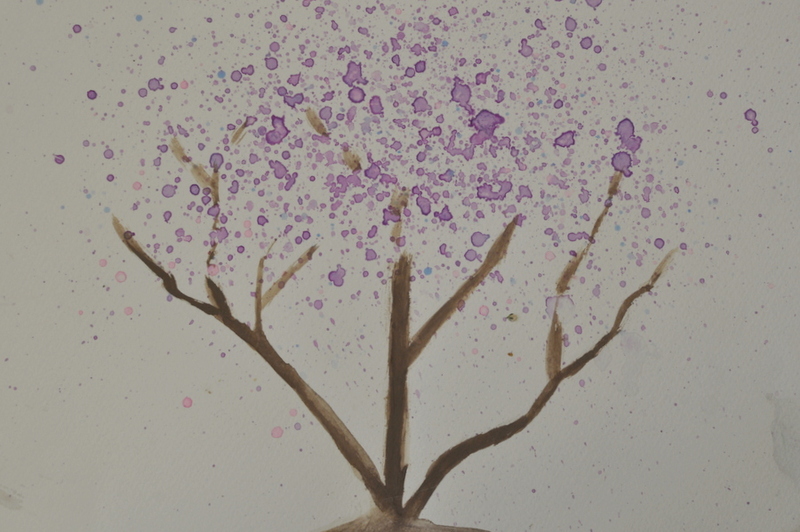 You can keep doing this process (paint / allow to dry / paint / allow to dry) until you’re happy with the blossoms. 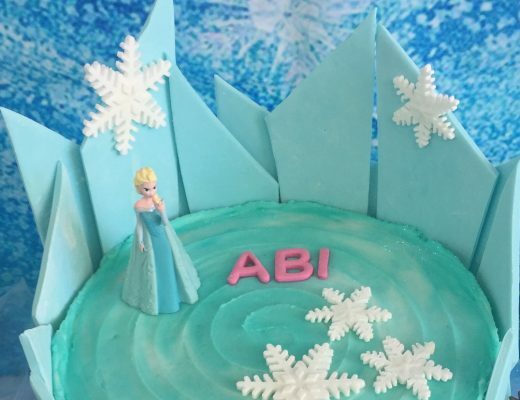 Here’s one that Miss 8 did later, all by herself without any supervision. 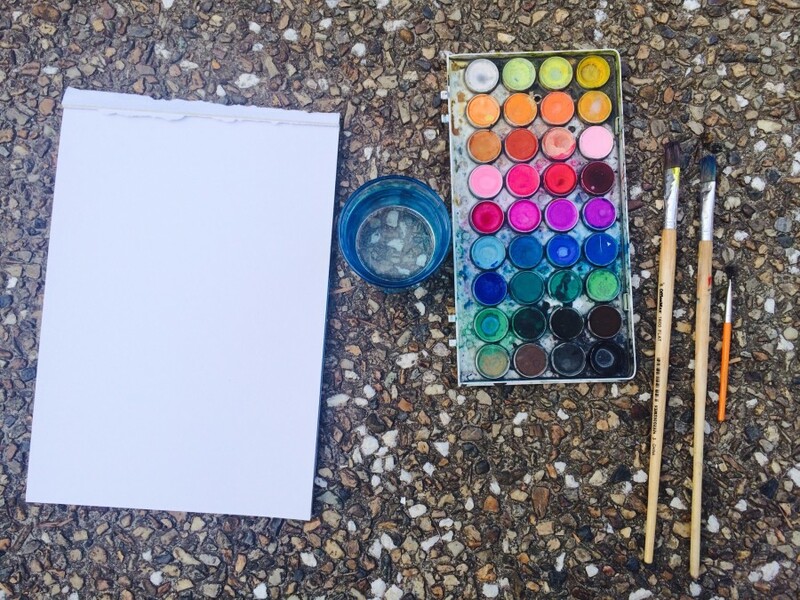 An easy painting product to celebrate Spring! 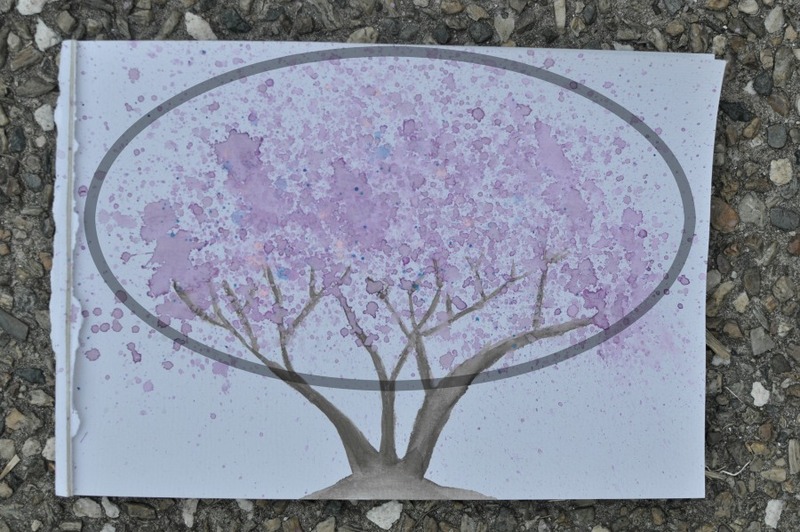 This process would work well for a cherry blossom tree too! You could make a row of them! 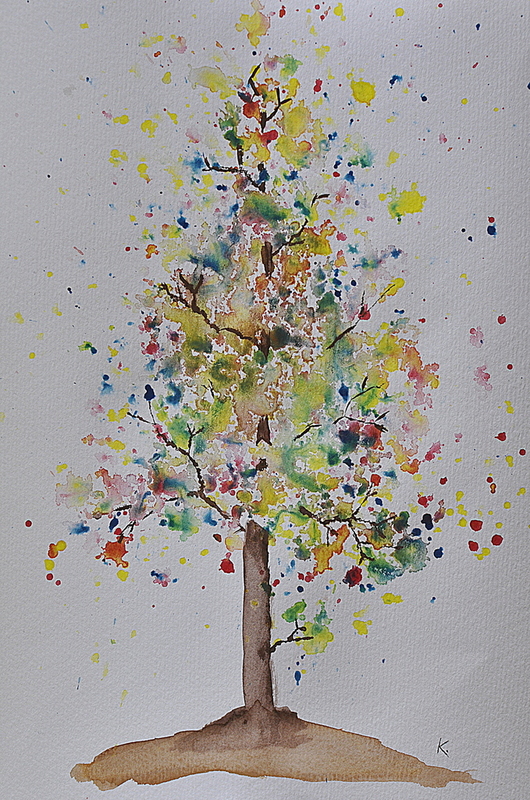 Check out the Autumn Tree tutorial by clicking the picture below. 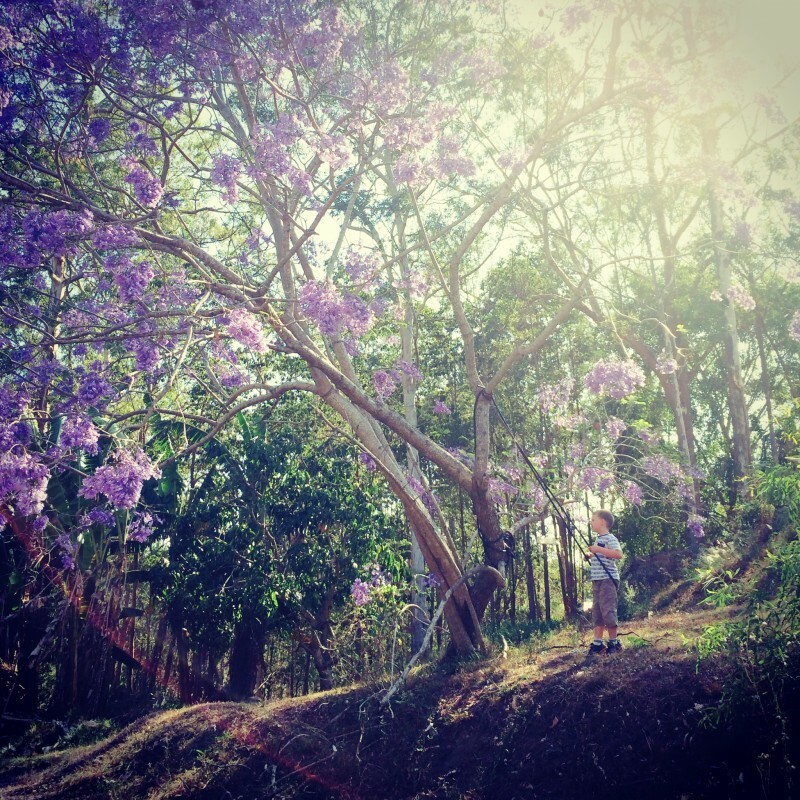 Hi Kelly, beautiful picture – I love jacarandas too as they played a big part in my childhood! I am curious to know the name and location of the street in your photograph, it is stunning! Hi Rachel. Yes, me too! Such beautiful trees. I sourced this picture and it was taken in Harare in Zimbabwe. Everyone should plant more of them! They make the world a happier place! 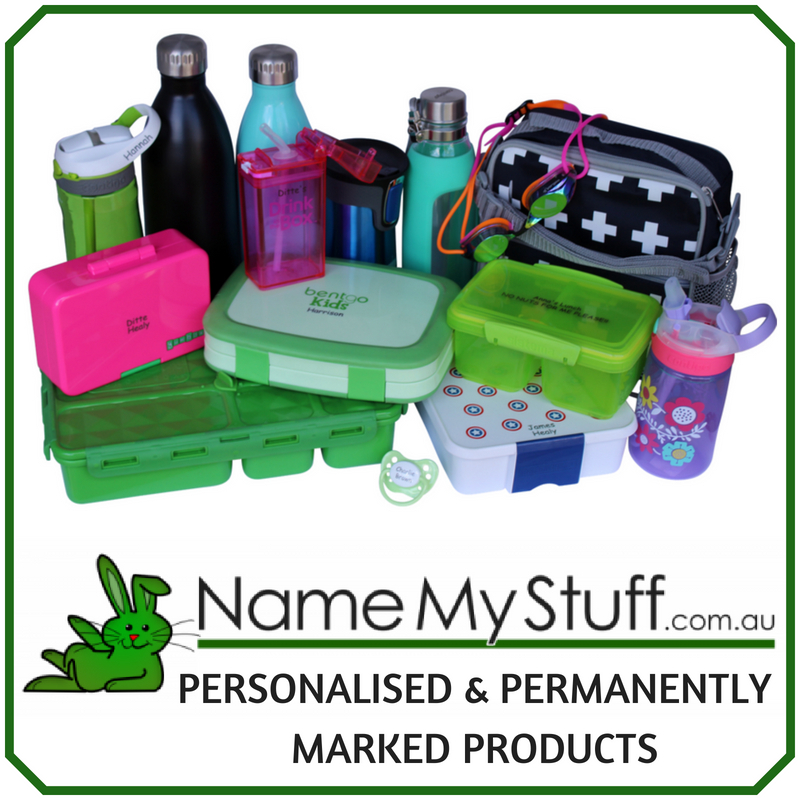 Kelly… as a Mum working from home who finds it difficult to juggle work and family commitments, your blog makes it easier to spend meaningful, quality time with my kids. Its so refreshing to not have to think for once and just follow your instructions!!!! Thanks for making the days at our place just a little more fun! I hope you know you are making a difference in our lives. 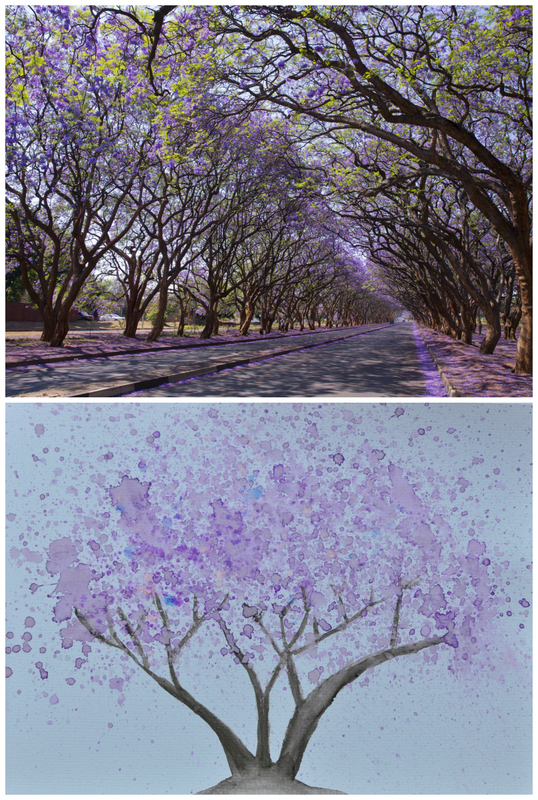 what a beautiful painting of the jacaranda tree. Any reason why it wouldn’t work on a canvas?? I’d love to get my kids to do it on a canvas and put it up in their room. I think it would work well on canvas too.